For over sixty-five years, the United States war machine has been on automatic pilot. Since World War II we have been conditioned to believe that America’s motives in ‘exporting’ democracy are honourable,even noble. In this startling and provocative book,William Blum, a leading dissident chronicler of US foreign policy and the author of controversial bestseller Rogue State, argues that nothing could be further from the truth. Moreover, unless this fallacyis unlearned, and until people understand fully the worldwide suffering American policy has caused, wewill never be able to stop the monster. 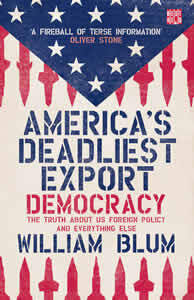 William Blum is one of the United States’ leading non-mainstream experts on American foreign policy. He left the State Department in 1967, abandoning his aspiration of becoming a Foreign Service Officer because of his opposition to what the US was doing in Vietnam. He then became a founder and editor of the Washington Free Press, the first ‘alternative’ newspaper in the capital. Blum has been a freelance journalist in the US, Europe, and South America. His stay in Chile in 1972–1973, writing about the Allende government’s ‘socialistexperiment,’ and then the tragic overthrow of that government in a CIA-designed coup, instilled in him personal involvement and an even more heightened interest in what his government was doing in various corners of the world. His book Killing Hope: US Military and CIA Interventions Since World War II has received international acclaim. Noam Chomsky called it ‘Far and away the best book on the topic.’ In 1999 he was one of the recipients of a Project Censored award for ‘exemplary journalism.’ Blum is also the author of Rogue State: A Guide to the World’s Only Superpower, West-Bloc Dissident: A Cold War Memoir, and Freeing the World to Death: Essays on the American Empire. His books have been translated into 27 foreign-language editions. In January 2006, a tape from Osama bin Laden stated that ‘it would be useful’ for Americans to read Rogue State, to gain a better understanding of their enemy. Blum currently sends out a monthly Internet newsletter, the Anti-Empire Report.